An X-2 class solar flare recently missed a direct impact with Earth. Heliophysicists classify solar flares according to their brightness in X-ray wavelengths. C-class flares are the smallest on the scale, with X-ray measurements in the 10^-6 watts per square meter range (W/m^2), while X-class flares can exceed 10^-4 W/m^2. Why is that important? An X-2 solar flare has enough energy to overload satellite circuits and disrupt other forms of communication should its full force be directed at Earth. 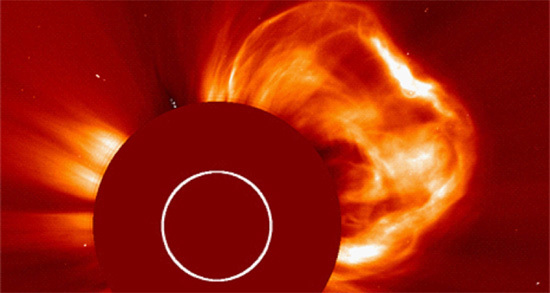 Modern astronomers believe that solar flares, or coronal mass ejections (CME), occur when magnetic reconnection events in the Sun’s atmosphere cause a short circuit in magnetic field lines. According to one theory, “magnetic energy” then accelerates the superheated gases into space. Although no one knows what “magnetic reconnection” is, it is the only explanation offered. The prevailing view is that the Sun accelerates charged particles away from its surface in the same way that sound waves are amplified. Pulsations in the solar photosphere travel along “magneto-acoustic wave-guides,” otherwise known as magnetic flux tubes. It is that kinetic effect that pushes “hot gas” outward. However, in an Electric Universe filled with electric stars, there is a more obvious explanation: electric fields in space. Whenever there is a separation of charges in a plasma, an electric field will appear between those regions. That field can accelerate solar ions, forming coherent flows of electric charge throughout the Solar System. Solar flares could be like tremendous lightning bursts on the Sun, discharging matter at near relativistic speeds. The circuit that connects the Sun with the Milky Way might extend for hundreds of thousands of light-years. How much electrical energy is contained in those “transmission lines” feeding the solar anode? The Electric Sun theory postulates that sunspots, solar flares, anomalous coronal heating, and coronal mass ejections are due to changes in the electrical input from our galaxy.Birkeland current filaments carry electricity through the Solar System, supplying more or less power to the Sun as they go.